COCOA, Fla., March 16, 2015 – Electric Vehicle drivers now have a place to charge up on the Space Coast in Cocoa. Located just two miles off State Road 528, otherwise known as the “Beachline,”—a main artery connecting Orlando to the Space Coast —the University of Central Florida’s Florida Solar Energy Center (FSEC) is now home to a Direct Current (DC) Fast Charger and a dual Level 2 charger. 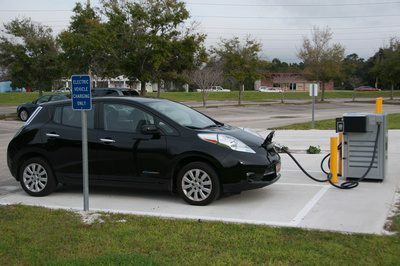 The grand opening of UCF’s re-charging facility at FSEC is scheduled for Friday, March 20 at 11 a.m. Nissan will be offering a Ride & Drive for the all-electric Nissan LEAF® from 11:30 a.m. until 1:00 p.m. A variety of electric and plug-in hybrid vehicles will also be on display. The public is invited to attend and participate in this special event. Donated by Nissan North America, and provided by NovaCharge, a leading provider and integrator of EV charging solutions nationwide, the DC Fast Charger is a first for UCF, as well as the City of Cocoa.